Nissan Leaf Pricing: $32,780 minus up to $7,500 in federal tax credits. Charging station not included. Nissan's all-electric Leaf now has a price: $32,780. There are up to $7,500 in federal tax credits, which will bring the price down to as low as $25,280. Consumers can also lease the Leaf for $349 a month, not including state or local incentives, which could further reduce the net cost of the Nissan Leaf. This includes three years of roadside assistance, too. 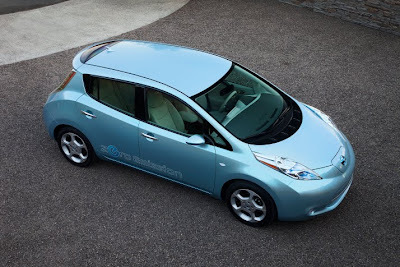 Additionally, there are an array of state and local incentives that may further defray the costs and increase the benefits of owning and charging a Nissan Leaf , such as a $5,000 statewide tax rebate in California; a $5,000 tax credit in Georgia; a $1,500 tax credit in Oregon; and carpool-lane access in some states, including California. Nissan is managing the purchase process from the first step, when consumers sign up on NissanUSA.com, until the customer takes the Nissan Leaf home and plugs it into a personal charging dock. Speaking of charging , the dock will cost an average of $2,200; up to $2,000 of that may be eligible for a 50% federal tax credit. Nissan claims each "fill up" will coast less than $3. I'm interested to see if electric vehicles will ever become mainstream. It would be kind of cool if they do.